The first thing I did after I read The Long Way to a Small, Angry Planet last month was pre-ordering this book, so it’s probably an understatement to say that I’ve been excited to read it. A Closed and Common Orbit is set in the same universe as The Long Way to a Small, Angry Planet and follows from the events of that book. It has a couple of shared characters, but it’s entirely standalone. We follow Lovelace, a sentient artificial intelligence designed to run a spaceship, who has been downloaded into a humanoid body because of circumstances not entirely in her control. AIs in bodies are illegal in the Galactic Commonwealth, and she has to figure out how to blend in as a human while staying under the radar. The secondary protagonist is Pepper, an engineer who helps Lovelace in part because of her past experience with AIs. We get to see how she grew up and eventually the story ties into Pepper and Lovelace’s present life. 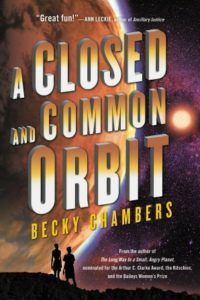 I love the cozy feel of this story – it’s not something that I usually associate with science fiction, and I hope Becky Chambers keeps writing these kinds of stories forever. And this isn’t just science fiction, it’s good science fiction. Lovelace’s story reminded me a little of Breq from Ancillary Justice – she’s an AI trying to make sense of an existence she’s really not designed for, but their personalities and stories are very different. Breq was an imperial warship, but Lovelace is a friendly and accommodating AI designed to be as human as possible. Lovelace and Pepper both have pretty screwed up circumstances, but they make the best of it and end up being really great people who are at peace with themselves. I think that’s what I love about these books – every character genuinely wants to be good. Sometimes things fall together in a way that seems a little too neat, but I’m happy to suspend my disbelief for it because it makes for such a good story. I’m not sure if there’s going to be another book in this universe, I hope there is because Amazon has A Closed and Common Orbit labeled as “Book 2 of 3”, even though there’s no third book to be found. Regardless, I’m going to read whatever Becky Chambers writes next as soon as I can. This entry was posted in Books, Reviews and tagged book 2, fiction, science fiction by Kriti Godey. Bookmark the permalink.